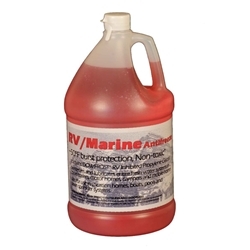 Winterize, lubricate and protect your valuable RV investment with RV Antifreeze. Helps prevent freezing in all types of fresh water systems from RVs to vacation homes, boats, and pools. Made from Inhibited Propylene Glycol, this non-injurious, essentially non-toxic, tasteless, odorless antifreeze meets the FDA's "GRAS" rating (Generally Regarded As Safe).